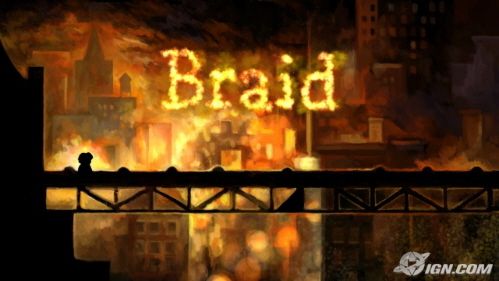 Braid is the single most important game released this year. Ever since technology caught up with our hobby and evolved it from simple beeps and blips and tests of hand-eye coordination into a medium capable of spinning a decent yarn and taking the player away to awe-inspiring worlds of wonder, the argument of ‘Games as Art’ has gathered strength. In the past year, the debate has raged with film critic Roger Ebert famously battling author Clive Barker over the topic. Ebert declared that no game can be considered art since the creator hands over control to the user to craft the experience. Barker countered that exact point – that art is truly defined by the experience we take from our own individual encounters with someone else’s creative endeavor. Ebert’s assertions seem rooted in the past; the Neolithic 8-bit era and earlier (it’s true, gaming lacks a Cave Art period). Many of Ebert’s readers tossed Shadow of the Colossus into the mix as proof positive that this medium can inspire and stir the soul. The jury is still out on whether he agrees. If the argument for ‘Games as Art’ needed more support, designer Jonathan Blow just delivered the Sistine Chapel with the release of his masterpiece, Braid. Braid is an easy title to describe but difficult to define. On the surface, it is a 2D-platform puzzler that places the gamer in familiar territory before completely pulling the rug out. In the game, the player takes control of Tim, a hero on a quest for his lost princess – who we are told, Tim lost to a monster after making a dire mistake. That’s the set-up for Tim’s journey through an escalating series of surrealistic dreamscapes as he seeks to set right the things that went so horribly wrong by encountering and besting a number of level specific brain games. The controls are wonderfully simplistic – harkening back to the 8-bit joys that inspired this title. The A button controls your jumps and the game design accommodates tight, pixel perfect leaps which can be key to some of the more tricky puzzles encountered later in the game. The X button controls time, using a similar mechanic seen in the recent Prince of Persia titles, allowing the player to rewind their actions in order to cheat death or solve the latest conundrum. Each world is separated into different levels that contain anywhere from one to four puzzle pieces. The puzzle pieces are easy to spot but the trick to obtaining them usually involves solving an environmental puzzle using a combination of your jumping and time manipulation skills as well as the particular logic laid out in each world. For instance, on some levels your actual movements will work to control time. When the player moves right, time moves forward. When the player moves left, time reverses. Proper manipulation of this logic, timed with your own temporal abilities is the key to scoring that elusive puzzle piece. While players can easily race from one end of a level to the other without picking up a puzzle piece, doing so really ruins the point. Braid is all about the journey. As players solve the individual puzzles, they are rewarded with puzzle pieces that can be fitted into a picture frame. The completed pictures then become part of the overall narrative tapestry – with every image and sound doing its part to tell the story. Tim’s strange plight is eventually revealed through a masterful combination of the completed portraits, snippets of journals that are found before each world and ultimately through the player’s actions as revealed in the game’s stunning (and emotionally shattering) conclusion. It’s a great opening that takes the archetypes laid out in the original Super Mario Brothers (the old ‘Save the Princess’ gag) and uses them as blue print for an expert deconstruction of video gaming. At once, Blow is paying homage to a genuine touchstone moment that helped birth modern gaming while twisting our expectations of what should follow. Our avatar Tim, like countless video game heroes before him, is on a quest to save his princess. We’ve been down this path before, countless times, and just at the moment we encounter that first green pipe growing from emerald grass, Braid takes a twist and warps us to the road less traveled. This is never more evident than in those first fledgling moments. As the gamer falls under the trance of Braid’s Impressionist watercolor backdrops and lush Celtic score, the first clue that we’re in uncharted territory is when the gamer enters their first door into World 2. My first reaction was to exit the door and see if I somehow missed the door to World 1. As I was quick to discover, this is the genius of Braid – everything is a puzzle yet the clues are all around and the big picture will become clear all in good time. The game toys with our expectations giving you World 2 when you expected World 1. And that’s just the beginning. 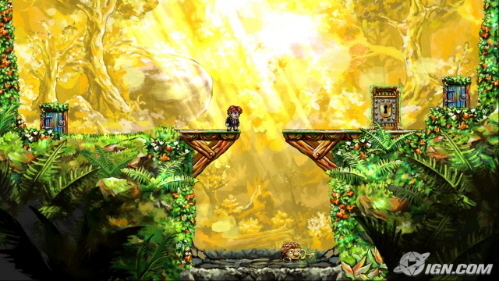 While Braid presents a brief experience (on average it will take about 6 – 8 hours to puzzle through the adventure), there isn’t a wasted moment here. Each moment of this game has been handcrafted to deliver an interesting and compelling experience. Repetition never sinks in as the game is designed in such a fashion that the moment you get a full grip on the latest temporal power or logic to a level, the game introduces a new concept and later forces the player to combine all of their learned experience into one organic whole just in time to call upon all those skills when your Princess needs you most. I don’t make the ‘Games as Art’ comparison lightly and it goes beyond the surface aesthetics of the title. Yes, this is a beautiful game with lovingly hand painted watercolor backdrops that just shimmer in high definition. You’ll want to frame this. And the aural soundscape will haunt your dreams. So, taken apart, the various components all reflect stellar levels of artisanship. Combined, Braid takes on its own identity as a masterwork. Like the best of art, what you get out of Braid is equal to what you put in. Those who are simply looking for a game to challenge them will find an escalating series of puzzles that truly tease the brain. At its base level, this is one of the most innovative puzzle games to come out since Portal. But, there are deeper levels at play for those who want to commit further. I knew that when I was replaying the final moments in my head – hours later – I suddenly hit upon the genius of Blow’s game design, that there was much more at play here. Some will look at Braid and see a great puzzle game. Others will find a clever deconstruction of video game clichés. One might intuit a deep meditation on the subjects of obsession and the true meaning of love. But that’s just my interpretation – no more right or wrong than yours. It’s difficult to tread further without revealing too much. I wouldn’t dream of describing Starry Night to someone, I would just show them and let them draw their own conclusions. What I can say is that as Braid ascends towards its thrilling climax, all of the disparate elements come into place and the player realizes that the whole story was right before their very eyes all along. Jonathan Blow has not only crafted a challenging entertainment, he’s also delivered the medium its own Memento. 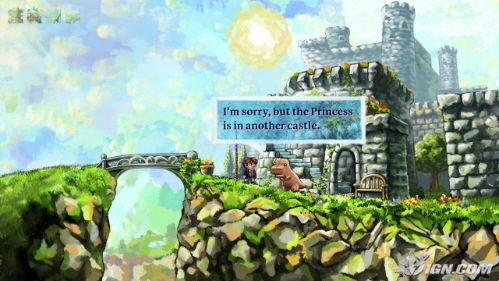 It’s games like Braid that renew my enthusiasm for this medium. In an age where every gaming convention has seemingly been repeated and cloned, it’s refreshing to see someone take something so familiar and show it to me in a completely different light. In turn, they take the act of playing a game and make it a brave new world all over again. Braid is not only the most important game released this year. It’s also the best. I loved this game and I wholeheartedly agree with you about it being the best of the year. I know there are a few other games that will drop this year that should be great, but this one should still stand above them. From the watercolor backdrops to the beautiful music, it is a work of art. There is no doubt that the blending of different kinds of art into a new medium made this feel like you were playing in a piece of art. This is much like the recent Metal Gear Solid games or RPGs like Mass Effect and Star Wars Knights of the Old Republic. The homage to Mario was very cool and the puzzles were some of the most innovative I have ever come up against in a game. This game is truly special and highly recommended!